If you haven’t heard about Beth Zupec-Kania, then you’re in for a treat! Beth spent the last 27 years as a Registered Dietician helping many parents implement a keto diet for seizures. Through the Charlie Foundation for Ketogenic Therapies, Beth worked primarily with children using ketogenic therapy for epilepsy. Also the designer of the KetoDietCalculator, which has been around for 20+ years, Beth has been using keto long before it was a popular dietary approach. 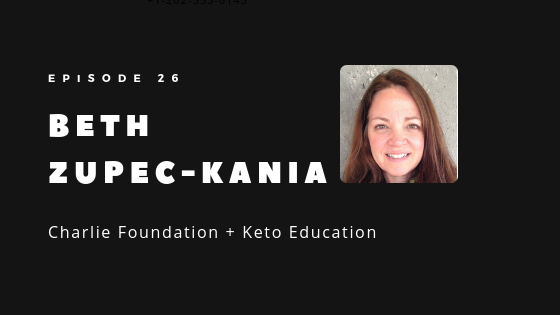 A pioneer in ketogenic therapy’s resurgence, Beth Zupec-Kania has been instrumental in spreading knowledge about the keto diet through the Charlie Foundation. She educates hospital staff and parents on how to implement ketogenic therapy all over the world, giving many families hope. So far, Beth and the Charlie Foundation have trained over 200 hospitals in ten countries! Founded in 1994 by Jim Abrahams, The Charlie Foundation came into existence because of Jim’s son Charlie, who found success with a keto diet for seizures. In 1993, when Charlie, a baby then, failed to respond to epilepsy medications, Jim wasn’t willing to take ‘good enough’ as an answer. Digging into the textbooks, he found a possibility in the ketogenic diet. Within a month, Charlie became seizure and drug free. Most important, now an adult, Charlie has never had a seizure again! Now in its 25th year, the Charlie Foundation is a non-profit organization. It provides information about ketogenic therapy for those with epilepsy, neurological disorders, and certain cancers. All donations are not only used directly for education but are matched by Jim Abrams. You can contact Beth through the Charlie Foundation Contact page for educational training. This is also a great resource for finding practitioners trained in the ketogenic diet for therapeutic use.